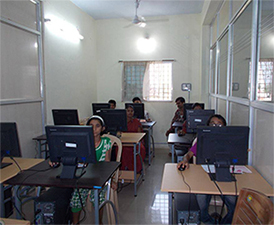 This centre aims at introduction, management, promotion and application of Computer literacy to raise level of awareness, capacity, efficiency, confidence and aspiration of locals. We are partly supported by Infosys in establishing infrastructure. 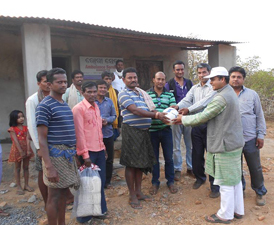 The centre is located in Nabarangpur town which is in middle of KBK region. This centre has a capacity of accommodating 50 trainees at a time, a lab with 20 computers, separate rooms for practical and theory classes, water & wash facilities. 24 hours power back up and broad band internet facility is also available. We have a small section in this facility known as ‘Window to the World’ offering internet access to farmers, women and students for absolutely free. Idea is to expose them to developments taking place around the world so that they start imagining and aspiring for more meaningful life. Staff includes Project Director (Training), Instructors, Centre-in-charge, coordinators and housekeeping in-charge. Our fee is lowest amongst different institutions offering computer courses in KBK region. Socially and economically weak candidates get our complete course only for Rs. 375/-. Besides arranging sponsorships for people who cannot afford paying even such low fee we waive off fee totally in deserving cases. Banks are under an obligation to recognize our certificates to grant entrepreneurs’ loans. Eligibility for our courses commences from Class 8th onwards. We have specialized computer courses known as CLAP for children between 6 and 14 years age group. Kindly consider sponsoring a group of 10 students by contributing Rs. 15,000/-. Please go to sponsor a needy section. Our facility accommodates 15 trainees at a time. House wives and school dropouts form majority of our trainees. In six months time we create tailors capable of stitching both tailor-made and readymade garments of daily use for males, females and children. We have opted and adopted scientific methods of teaching and training uneducated and little educated women. Our fee is comparatively very low and the learning ambience we provide is safe and secured. Kindly consider sponsoring a group of 5 women by contributing Rs. 10,000/-. Please go to sponsor a needy section. We have set-up training facilities to train farmers in low-cost, better and effective practices of water, soil, crop and post harvest management. Our institute is located over a sprawling 31 Acres of self owned land with different agriculture and horticulture demonstration farms. Odisha University of Agriculture & Technology (OUAT) as a 1st step towards declaring our project and facilities as an ‘extension / field education centre’ for its students and faculty has instructed Krishi Vigyan Kendra (KVK), Umerkote to work with us. At present KVK has been periodically conducting training and demonstration events in our centre; also organising farm-scientists and farmers meet. We have now submitted a proposal with National Horticulture Board (NHB) for “Development of commercial horticulture through production and post harvest management of horticulture crops”. At present such proposal is under active consideration. Kindly consider sponsoring a training event for 30 farmers’ by contributing Rs. 10,000/-. Please go to sponsor a needy section.